Another Sunday out for dinner, another sushi review, not the last of the series but almost – keep the hype for grand-final. So – you probably all have that friend who is always a bit picky and is not a fan of any exotic food. I am veeeery lucky and I have more than one 🙂 So much I like to try whatever kind of cuisine and, even when travelling, eating in whatever conditions, so much the most part of my closest crew is very traditional in terms of food choices. But sometimes you don’t feel like eating once again pizza or beef steak right? For these times when you have to get to a deal, one of the options for me is the restaurant Am Clubhaus, Op der Spora, located in Bambesch, just upstairs the tennis club. The reasons to choose this restaurants are definitely the lovely sunny terrace during the warm season and the traditional menu combined with a wide sushi choice prepared at a counter on view by Japanese chefs. We started with a mojito for aperitif and ordered then a mixed sushi / sashimi boat for 4 people and a portion of tempura shrimps. Wonder what, the picky person changed his mind and decided to have sushi as well (no comment). I also asked if a soup was included with the order – I remember it was the case last time I have been there – but I was replied if I wanted one I have to order it specifically. I did, only for me. The boat was anticipated by a small salad welcome from the house and, during the dinner, we had 2 bottles of Chablis and concluded with espresso and digestif for 4. Total bill read 70 Euro per person (280 Eur in total). Pictures of our dinner and some impressions about Am Clubhaus are following. As said, I like the fact they propose both a traditional French menu together with the sushi, so you are not obliged to stick to Japanese if you don’t want to. Personally, I always had sushi when I came there, but the other dishes don’t look back either. The sushi boat was huge and pretty good, with quite some variety. In particular, I adored the tuna tataki and the soft shell crabs rolls. While there were not many innovative combinations like other sushi restaurants I have tried recently, the fish was very fresh and tasty. Definitely a great choice if you like sushi. The service is quite slow – we waited ages between the starter and the boat. I can definitely understand it is because the sushi was prepared at the moment, but the place was quite empty and a good half of the other tables were eating a la carte. I cannot imagine how much you should wait to get your boat during busy days. I got a huge bowl of Miso soup as starter – so huge I had to share it with a friend, as I was not able to finish it. As to me the salad starter makes not much sense, I suppose with the boat you should give people the choice between a salad and a smaller bowl of soup. I was also a bit confused as a small bowl of Miso soup was indeed taken to another table next to ours instead of the salad, as happened to my at my previous visits (and therefore already included in the price). Mmm. About the latter, while the portions were quite big and the sushi fresh and tasty, I still had the impression the bill is not very cheap. In conclusion: Am Clubhaus Op der Spora is a great location for having sushi or traditional French cuisine. It is located in the lovely Bambesch, surrounded by the green, there is a kids playground nearby and during summer they offer a sunny terrace. The sushi boats are traditional but very tasty and, while the place is not cheap, it is recommended for a celebration or a special meeting with friends. And they are open on Sundays! After the Christmas break, we decided to have a reunion with my girlfriends and arrange a fancy dinner in town to celebrate New Year and couple of other various personal achievements. We got to the restaurant slightly in delay compared to the reserved time, after having advised, due to the crazy traffic and icy roads. Once arrived, we waited good ten minutes at the entrance, as nobody was in the reception area. We decided then to check upstairs and the waitress welcomed us to our table. We started with an aperitif while waiting for the crew to be completed and we decided then to go for a fish dinner. I had Tuna Carpaccio with Bottarga as starter and Crumbs-Bread Shrimps with Orange as main. Most of my friends went for the mixed carpaccio platter as starter and the tuna tataki as main. We had a decent Sicilian wine during the dinner and we concluded with some mirto and biscuits offered by the house. Some pictures of our dinner followed by my feelings about the night. The location is really fancy – perfect either for a reunion with friends or for a romantic date. The candle lights are giving a very special mood to the rooms. Dishes presentation is very appealing, the kind of you say “wow” when the plat arrives at the table. Unfortunately, food was not good at all: the presentation was giving a lot of expectations that remained poorly deluded. 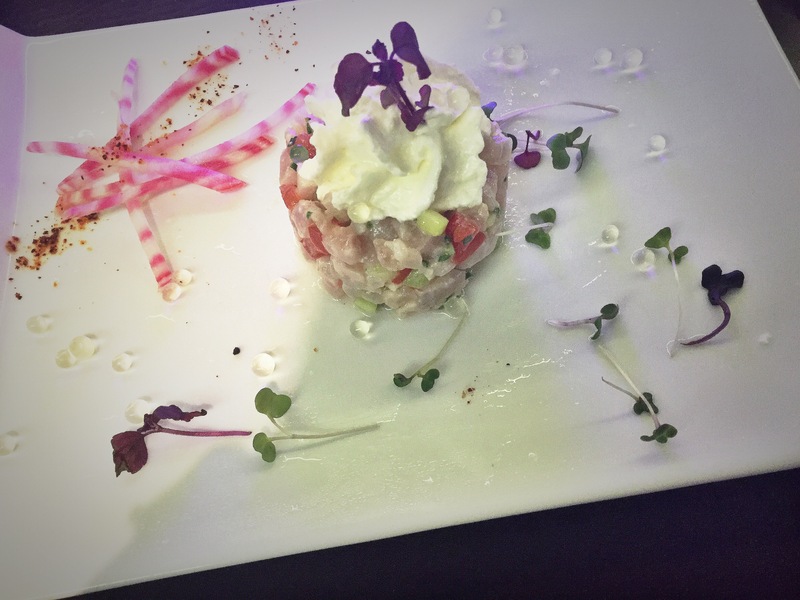 My carpaccio was extremely watery – you cannot even feel the fish – while the gambas were badly defrozen. Potatoes, vegetables, amuse bouche, everything was missing of taste, like ingredients were only nicely assembled for the presentation and not for the palate. Everybody had the same feeling: dishes were “fine” but not delicious as we remember them to be. Without being arrogant, I would say you can get a better level at home, with supermarket ingredients. In conclusion: I was really looking forward to come back to Essenza after long time, but my expectations were not satisfied. I remember it to be a very good Italian fish restaurant in town and now I would say it is on the average level, pricey side (we spent 62 euro each). While the location has lots of atmosphere and presentation of dishes was amazing, the food failed to impress us. Hope it was just a bad night for them. Last month-end closing at work was so much painful I did not have lots of time to go out, as you might have realized from the recent lack of my review posts. When my partner in crime Kochi proposed to have a dinner out the Friday of that week, I was indeed very glad she has chosen a place in Merl, very close to where we live now. Last time I have been to La Bergamote, it was still called Stan’s. The restaurant is located in Merl, at a very walkable distance from the city centre and in a quiet area. It has two floors, one at the level of the street and one below, with a cosy terrace, for which it was not yet the time due to the unpleasant rain. We got there at 8ish, after having reserved during the week, and the location was quite packed, but still not noisy. 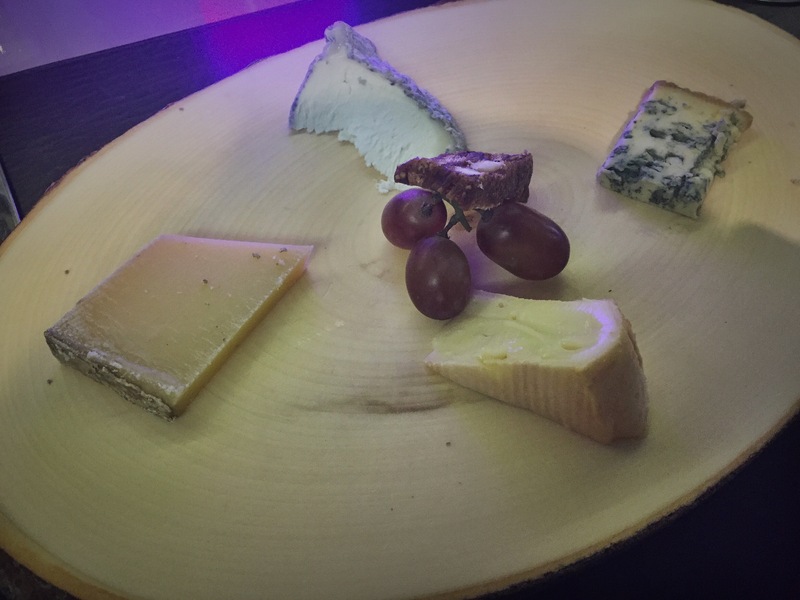 The settings are those from a brasserie, with a sophisticated accent and a minimal touch. My favourite piece was the ham cutter vintage machine on the corner, next to a neon column of bottles. After a look to the menu, we decided to go for the evening tasting, that proposes 3 courses at the astonishing price of 35 Euro. I was pretty surprised indeed to find such good deal, as I always retained the restaurant to be on the pricey side. 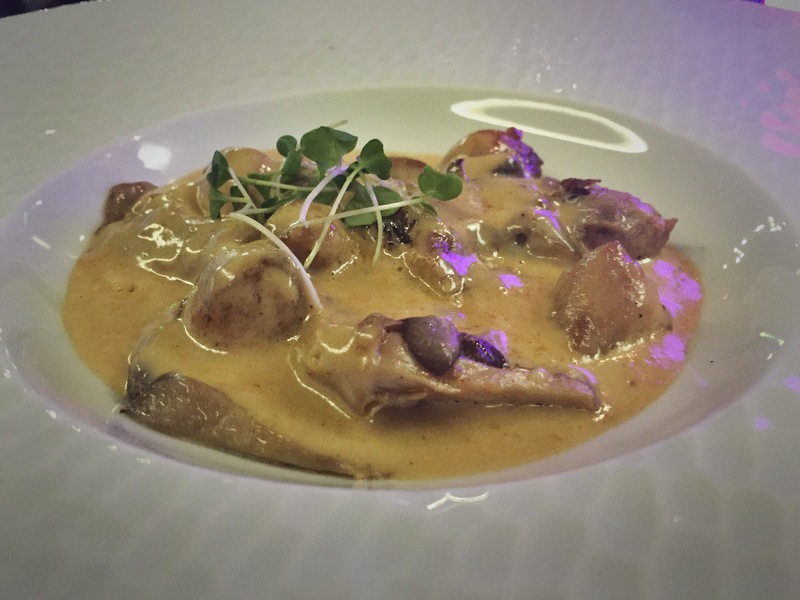 While the “a la carte” menu in fact proposed dishes around 28 – 30 euro, for the main, the tasting menu is definitely competitive if you don’t want to splurge. Discover our dinner in pictures and find my general impressions afterwards. We had a high-end dinner with brasserie price tag. All dishes were very tasty and well-prepared, with a refined presentation and cared in the details. 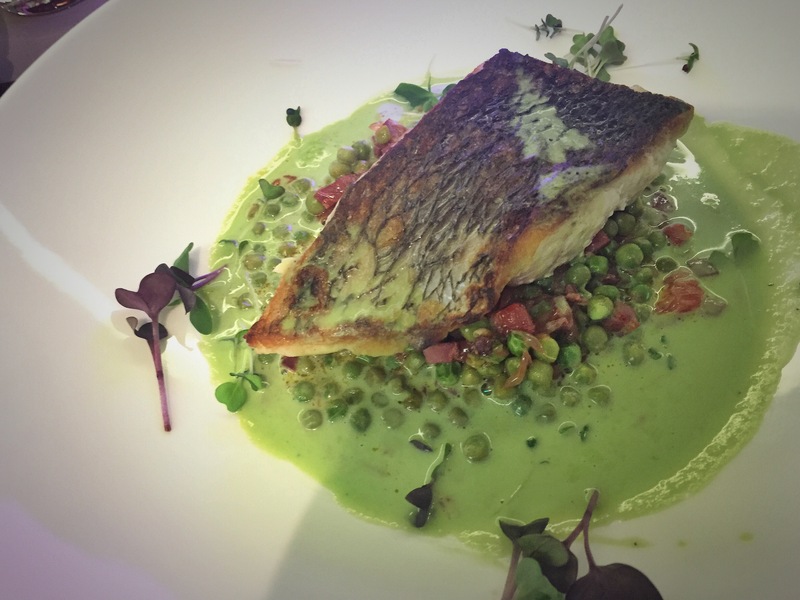 My fish dishes were very satisfactory and I liked the combination of tastes, the freshness of the raw materials and completeness of the plats in all their parts. Kochi was very happy about her starter, as she had a similar one recently in a gourmet restaurant and she noted this one was even better. Her veal meat was indeed great. Service was very professional and attentive. We got wine served, dishes explained in details, requested satisfied and correct timings for the dinner. The location is very relaxed and you don’t feel stressed by the rythme of the city centre. While the combination between the location and the tasting menu price is perfect, I would not be much convinced going to La Bergamote for a la carte full dinner, as it might get a bit too much expensive for the kind of settings – for example: tables are a bit too close for my taste. 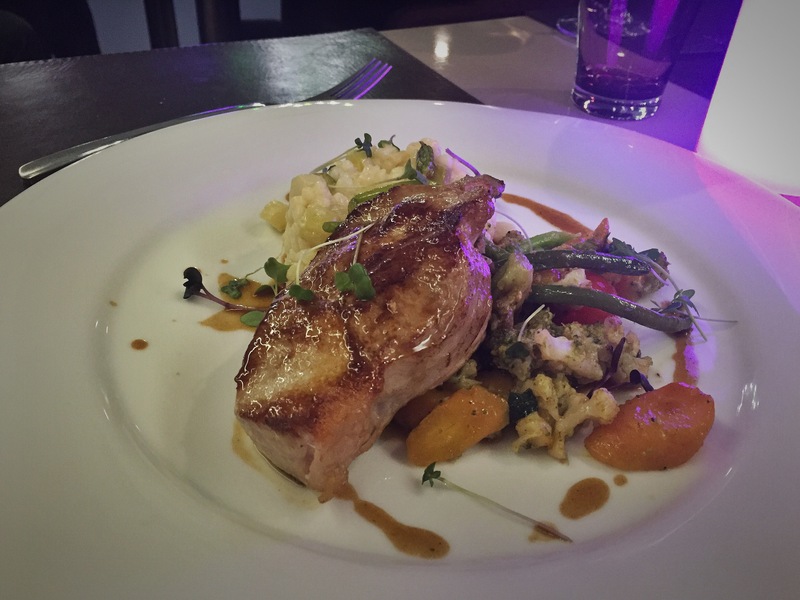 The only deluding dishes among ours was Kochi’s veal – as per above the meat was extremely good and well cooked, but the fregola is meant to be prepared in a soupy way and as a risotto was plain and overcooked. Same same for the vegetables, that deserved al dente cooking point and missed it very much. In conclusion: I personally really enjoyed my dinner at La Bergamote. I would definitely suggest to visit the restaurant and go for the tasting menu if you are looking for a sophisticated dinner with a reasonable price. Perfect for a tete-a-tete or a girls gossip night. If you are following my blog, you probably know already Indian is one of my favourite cuisine and this passion is not shared by my husband – so while in the past I used to eat Indian at least once per week, now I am allowed to order take-away on my single nights at home. So you can imagine that when, last week end, my partner in crime Kochi proposed me to have a relaxed dinner at an Indian in town before meeting my sister, I was very happy. We got to Star of Asia around 8 pm after having booked, the restaurant was packed but still fine to talk and have vital space around. I have never visited the restaurant before and I particularly like the colonial settings. 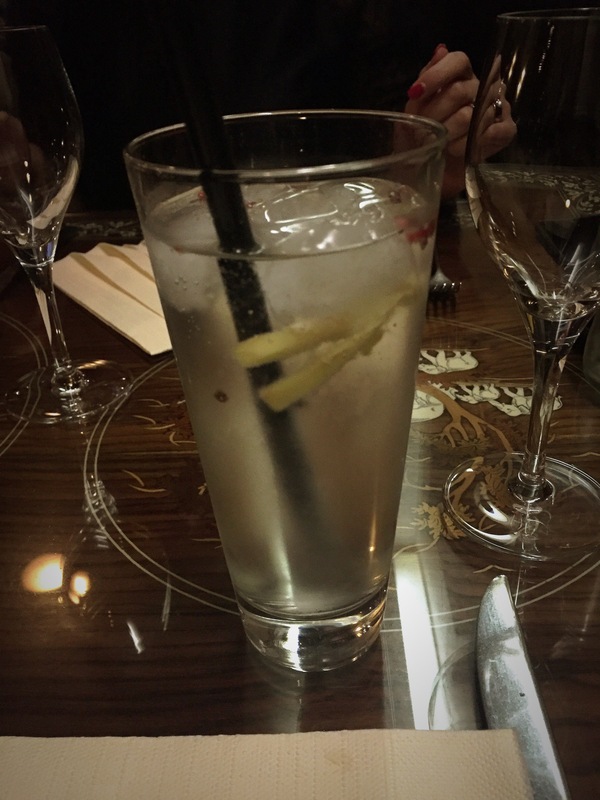 We ordered a gin as aperitif – I went for an Elephant Gin, that was very good, a pity it was not served in the right glass and was accompanied by Schweppes Tonic – later I have seen another table receiving their gins with Fever Tree. 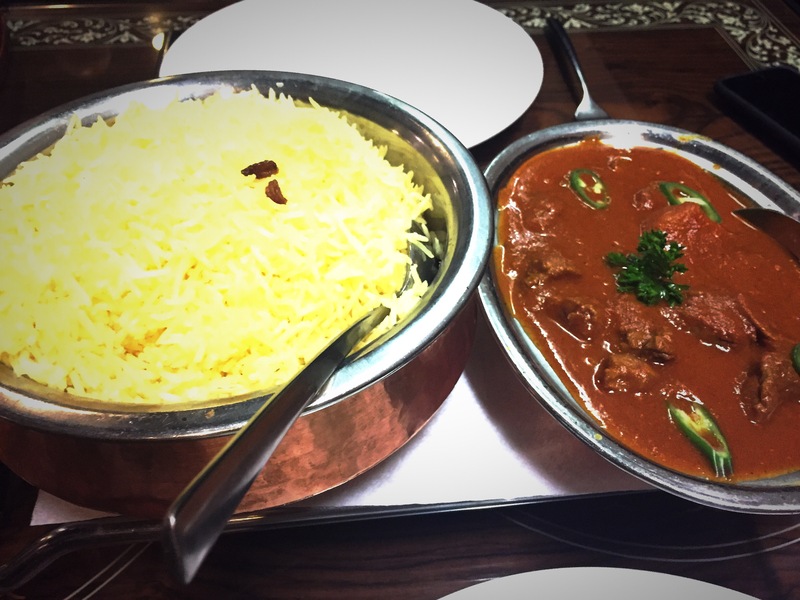 As food, I went for a Vindaloo Lamb – my favourite Indian dish – and a Cheese Naan. The waiter pointed out – as usually happens – that the dish was hot spicy and I confirmed it was very fine to me, as I love spicy food. I will keep my considerationa regarding the food for later. Together with the food, we ordered a bottle of rose’ wine – my fault, it was a very bad one. We concluded with coffee and Indian digestif, paan. After the pictures, find out if and what I liked about Star of Asia.. Unfortunately, I did not like much. The ambience is pretty pleasant, even if a bit dark and the location very central. Everything else will be for me in next tab. I did not like the food, sorry. I had thousands od Vindaloo in my entire life and I cooked it myself as well to tell you that that one was a very bad one. It seemed to be prepared with pasta tomato sauce, plus it was everything but spicy plus there was only one piece of potato. The cheese naan was a joke as well: it was a normal naan that has been covered with parmesan cheese and gratinee’. 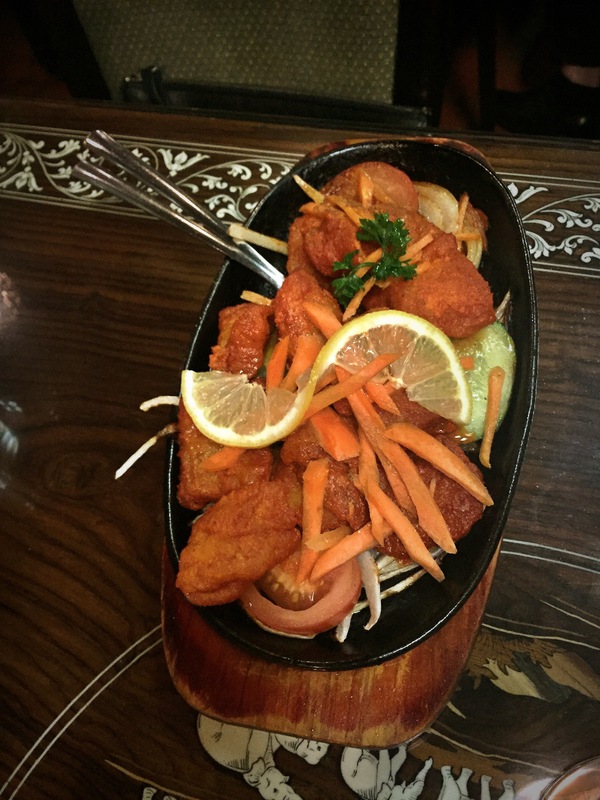 I have seen most of the people around – including my friends – having tandoori, so maybe tandoori was a better choice. Service was pretty distract and inefficient: waited too much for being asked for drinks, waited too much to order, waited too much to have dishes removed from the table. I perfectly see on Saturday night you like having a relaxed dinner, but almost three hours for having only one drink and one dish are definitely too much. Prices are a joke as well – I had to re-do the count couple of times to realized we paid 57 euro each for one drink, one dish, a cheap bottle of wine (27 euro, divided per three) and a digestif. Not worth it. In conclusion: maybe because I had very high expectations and my favourite dish (Vindaloo) was not one of their specialities, I was very deluded by Star of Asia. As they are plenty of good Indian restaurants in Luxembourg, I would definitely not come back any time soon.